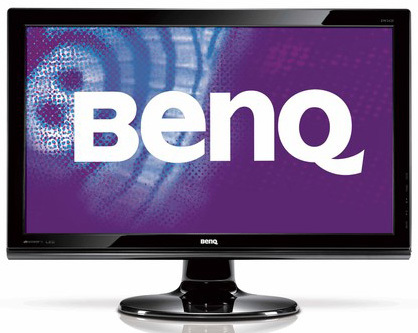 BenQ have made quite a splash with the recent release of their "World's 1st" VA LED monitor. The EW2420 is not the only model in BenQ's range to pair a VA panel with LED backlighting technology, as others have emerged since (VW2420, VW2420H and BL2400PT for instance). However, this is the first of its kind and offers at a very attractive retail price. 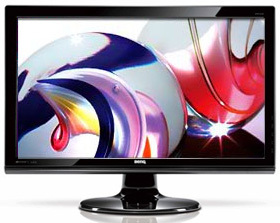 The reason for all the interest is really the growing trend in the desktop monitor market of using LED backlighting. We recently published an in depth article about LED backlighting, its variations and benefits, and also dispelling some of the marketing hype and myths that seem to be out there. We will talk about this briefly later on, but in the mean time you may well want to read our full article. With the growing production of LED backlighting, in this case White-LED (W-LED), there have been more and more screens emerging in the market using this technology. Driving down costs has also played a key part in recent marketing strategy for sure, and the W-LED backlighting has thus far almost exclusively been paired with TN Film panels. This has allowed manufacturers to introduce low cost screens, with energy saving capabilities in mind. This has been combined with the continuing hype around dynamic contrast ratios (with figures in the millions now!) and the supposed other "advantages" of LED backlighting. We'll talk more about this later, and there's more detail in our full article. BenQ have been the first manufacturer to pair W-LED backlighting with VA panel technology however. In this case, they have used the latest AMVA modules from AU Optronics. On a side note, the first mainstream W-LED monitor with IPS panel technolgy is set to be released very soon - the NEC EA232WMi. The screen itself is finished in a glossy black plastic. The bezel is fairly thin around the sides and top of the screen (~23mm) and a little bit thicker along the rounded bottom edge (~34mm). The glossy finish does pick up finger prints quite easily though which is a bit of a pain. The base of the stand clips simply into place when you unpack the screen and is sturdy enough. The whole screen is very light at about 3.9Kg net weight according to BenQ's spec. The W-LED backlighting has allowed the screen to be produced with a very thin profile which is nice, and of course helps with the weight. The screen features an almost 'semi-glossy' coating which is a little more shiny than a standard AR coating you will see from most modern monitors. It's not a full glossy solution and so does not suffer from the reflections and issues that some find with that panel coating method. It does however give a nice crisp feel to the image and I expect many people will like it. There is limited ergonomic adjustment possible from the EW2420 unfortunately with only a basic tilt function available. This tilt was a little stiff to operate but did allow a pretty decent useable range of movement. It would have been nice to see a height adjustment included from the stand, although expect it was left out for the sake of cost. The screen was at least pretty secure in its position and materials were of a pretty good standard. Perhaps due to its weight and all-plastic design, the screen did feel a bit more flimsy and less sturdy than some other models we have seen. The left hand edge of the screen offers quick and easy access to 2x USB 2.0 ports and a headphone jack. There are a further two USB ports on the underside at the back (along with the upstream connection from your PC). The audio input is also located on the back. There are also 2x 1.5W integrated speakers on the screen and you can see these from the underside of the screen. There is a headphone output on the left hand edge as well for easy access. At the back of the stand there is a simple clip up/down cable-tie. The right hand side of the screen features the OSD menu operation buttons. The buttons are pretty big and easy to use, and there are labels situated on the front bezel in a very subtle grey font which tell you what each will do. There is quick access to auto image adjust (D-sub input only), volume control, Senseye / colour mode and input selection. The power LED glows green in operation but is located on the bottom right hand edge so you cannot see it from a front view. During standby it flashes orange. The OSD menu itself is reasonably well equipped. There are quite a lot of options available for various features and navigation is pretty straight forward. The operational buttons are easy enough to use, and the up/down arrors can be used to scroll through each section and each option. The current mode (preset) is shown at the top of the menu no matter which section you are in. The picture section gives you access to the brightness and contrast controls as usual. These settings are retained individually for each preset mode which was good. You can also access the 'color' menu to switch between various colour temperature presets and gain access to the individual RGB channels. You will notice here as well there is an "AMA" option. This is BenQ's "Advanced Motion Accelerator" which turns the Response Time Compensation (RTC) impulse on and off. We will look at this a little later on in the responsiveness section. Within the 'picture advanced' menu there are options to change the preset mode, turn on the dynamic contrast ratio (if in a compatible preset mode) and also the options for aspect ratio control within the 'display mode' option. The back underside of the screen features a pretty decent range of interface options, especially when you consider this is a low cost screen really. There are the audio in/out-put connections along with 2x HDMI, DVI, D-sub, USB up and USB down (x2). Great to see two HDMI interfaces included here for connecting external devices such as games consoles and Blu-ray players. The digital interfaces are also HDCP compatible. Only thing missing really perhaps is DisplayPort, which is becoming increasingly popular nowadays. According to their website: "BenQ Senseye Technology brings the true colors of the world to your eyes through its six proprietary calibration settings. These are displayed via six pre-set mode – Standard, Movie, Game, Photo, sRGB and Eco – with the Eco Mode especially designed to save power and money." This technology is simply a series of presets as you might find on many modern screens. Each has supposedly been tailored to different uses. The dynamic contrast ratio is only available through the game, movie and photo modes. There is a 'Senseye Demo' option available via the OSD menu as well which shows you a split screen of the preset compared with the standard setting. If you enable the demo, the left hand side of the screen remains in standard mode, while the right hand side reverts to the selected new Senseye preset. In terms of power consumption the spec states maximum usage of 40W during operation and 28W in ECO mode. We tested this ourselves and found that out of the box the screen used a very low 33.6W of power. This was reduced to 25.0W after calibrated (see calibration section) since we had reduced the OSD brightness control. In standby, the screens power consumption was only 1.3W. The screen stayed very cool during use, even after being on for a long time. The unit made no noise or buzzing either. On a side note, I was also able to access the BenQ factory menu (hold menu button while powering on > press menu) to confirm that the panel being used here is AU Optronics' new M240HW02 V1. You can also disable the big purple BenQ screen boot-up logo if you want. 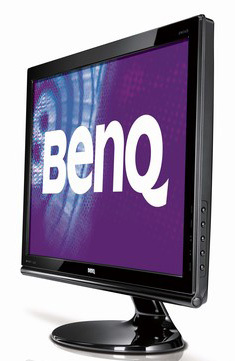 The BenQ EW2420 utilises an AU Optronics AMVA panel, capable of producing 16.7 million colours. Being W-LED backlit the screen can offer a colour gamut covering approximately 72% of the NTSC colour space according to BenQ's specification. Since this is a white-LED backlight, the gamut does not extend beyond this colour space like RGB LED, or indeed like W-CCFL backlighting would. This colour space is approximately the same as the sRGB reference. Initially to the naked eye the screen did feel a little overly bright, but not too severe. The OSD brightness control is set at 100% by default so you can of course turn this down to suit. The depth of blacks was immediately apparent, and they looked dark and inky. This is a strong point of these new W-LED backlit AMVA panels. Colours felt quite even and vivid to the naked eye. Testing with the colorimeter revealed the above results. 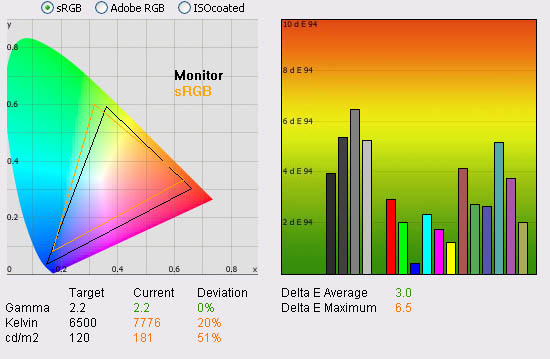 The CIE diagram confirms the colour space supported by the W-LED backlighting is fairly close to the sRGB reference. It does extend a little further in blue and red shades, and cannot quote cover all the green shades. Confirmation though that this is ~72% of the NTSC space as opposed to a wider gamut unit. Default gamma was a little off unfortunately with a reading of 2.5 average. With a target of 2.2, this was a 12% deviation. The appearance of the screen was not too bad to the naked eye in casual use, but you are going to want to correct this through calibration if you can for any colour critical work. It should be noted that you can manually adjust the monitors gamma setting in the OSD. By default this was listed as 2.2, but was recorded a little way off here. 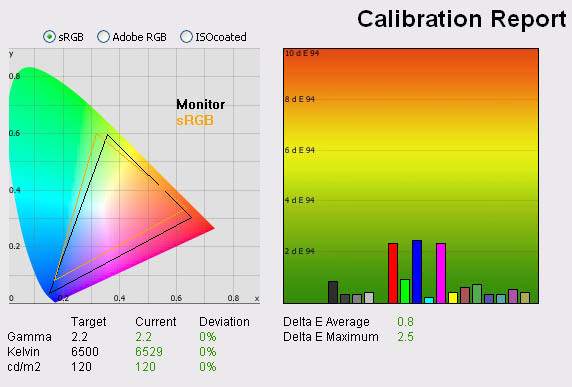 The screen does not come with any factory calibration of gamma and colours like some other competing models (e.g. Dell U2410). Presumably this has not been done to keep production, and therefore retail costs down, but those who require an accurate out-of-the-box setup may need to keep this in mind. Colour temperature was a little way out at 7519k, 16% deviance from the 6500k target. Luminance was also recorded at a pretty high 179 cd/m2, being a fair way out from the target of 120 cd/m2. The screen was set at 100% brightness by default so this can easily be turned down. However, at maximum brightness the screen could not reach the specified 250 cd/m2 maximum brightness. Even at this high luminance of 179 cd/m2, black depth was a phenominal 0.05 cd/m2! This gave us a static contrast ratio of 3578:1! This was above even the quoted 3000:1 figure from BenQ, and an incredible result from any modern panel. Certainly a big strong point of the EW2420 and AU Optronics' new panels. Colour accuracy was fairly moderate however. dE average was 4.8, with a maximum of 8.9. Calibration and profiling will certainly be needed if you want to do any colour critical work. I tested the screen with colour gradients as well which revealed some slight banding in darker tones. This was likely down to the poorly adjusted default gamma. More on that shortly. Out of interest, I also tested the "photo" preset mode at factory settings. When you switch into this preset the screen appears quite odd. The brightness is increased a little, but the colours are over-exaggerated and appear almost cartoony. The fonts and images also become less sharp somehow with a bit of a shadow appearance evident. It almost looks like a screen would if you turned up the graphics card digital vibrance control to a high level and enabled Cleartype in all applications. A very odd effect, not sure why you would want that in photo work!? It does the same kind of thing in the movie and game preset modes. Less accurate colours and cartoony images might be ok for those uses, but surely not for photo work! I tested this setting with the colorimeter as well. Gamma was actually improved to 1% deviation from the 2.2 target which was good. However, colour accuracy was reduced significantly with dE average of 6.9 now, and maximum of 14.5. I'll attempt to calibrate this preset later, but the weird feel of this mode and 'blurred' text would probably put most users off wanting to use it. If you revert to the sRGB preset mode, the image feels normal again with sharp fonts and normal looking colours. The screen looks maybe a little duller and the luminance has noticeably dropped. The validation above confirms the results are pretty much identical to the 'standard' preset mode, just with a lower luminance of 135 cd/m2 which is more comfortable. The other results were almost identical to the standard preset tests. Out of interest I switched the screen to the gamma setting of 2.0 in the OSD. The default 2.2 setting had actually returned us a recorded gamma of 2.5 and we had witnessed some banding in darker tones across colour gradients. Switching to this 2.0 gamma setting did help. The colorimeter recorded gamma now at 2.2 with 0% deviation. Colour gradients were also smoother, and the banding had disappeared. There was still some slight gradation in darker tones which is common on most modern screens, especially without extended internal processing and LUT's. This was an improvement anyway over the default 2.2 setting. Colour accuracy was also improved a little with average dE now down to 3.0, and maximum at 6.5. You would still want to turn the brightness down a fair way to be able to return a luminance of around 120 cd/m2 but this is a better starting point. Looks as if the factory calibration has gamma mode of 2.0 actually set at 2.2. I reverted back to the standard preset mode but within the OSD I changed the 'colour temperature' setting to 'user mode'. This allowed me access to the RGB channels as part of the calibration process. I also remained in gamma mode 2.0 since that had provided the best starting point and eliminated the banding we had seen in the 2.2 setting. 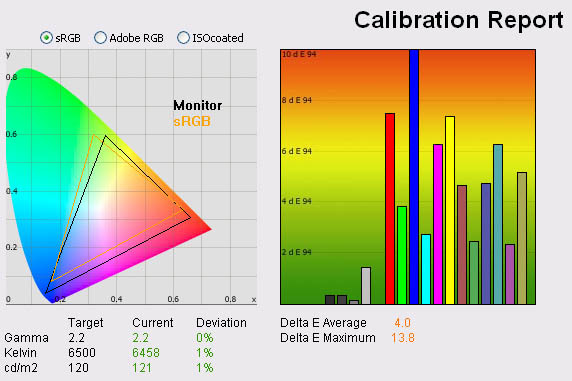 I followed LaCie's calibration process through, adjusting the OSD settings in line with the recommendations made in the process, and then letting the software carry out the LUT adjustments at a graphics card level and create an ICC profile. 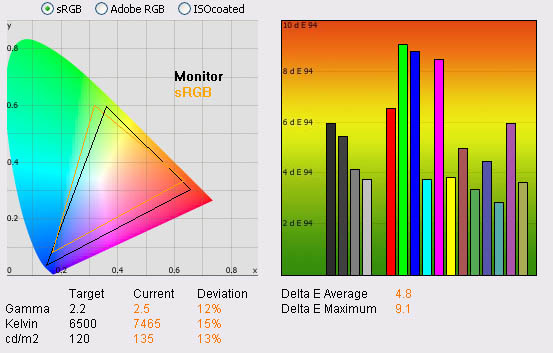 The screen does not feature a hardware LUT calibration option so other than the OSD alterations, the rest of the process is carried out at a graphcis card level in profiling the screen. The calibration was a success. Gamma was at 2.2, with a 0% deviation from our target. Colour temperature was <0.5% out at 6529k, and luminance had now been corrected to 120 cd/m2. 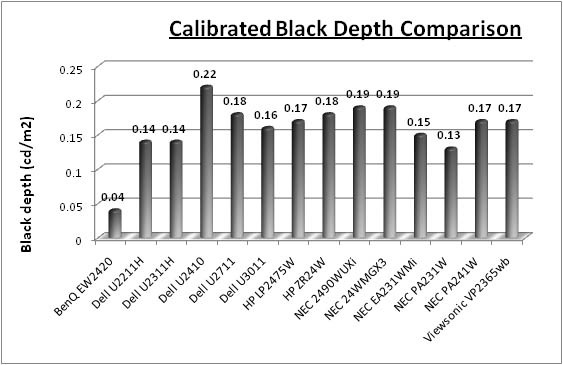 We had a black depth recorded at 0.04 cd/m2 which again is pretty amazing for any panel. Contrast ratio was 2995:1 which was almost spot on to the advertised 3000:1 figure in the spec. Colour accuracy was also improved significantly from the default 4.8 average / 8.9 maximum to 0.8 / 2.5. The process couldn't quite correct the colours completely and there still remained some slight variation between colour requested and colour displayed in some shades. Overall, on average LaCie would consider colour fidelity to be excellent here, but there was some slight difference which was a shame. Remember, W-LED backlighting does not have any bearing on the colour accuracy of the screen which is instead determined mainly by the panel technology. Colour gradients were pretty smooth with no banding visible. There was some slight gradation in darker tones. You can use our settings and calibrated ICC profile on your screen as well if you want. See our ICC profile database for more information. I also calibrated the screen in the photo preset. You cannot individually control the RGB channels in this preset or change the colour mode however so other than the brightness (changed to 55) there would be no adjustments to the monitor itself. The rest of the process would make adjustments to the graphics card LUT through profiling. On a side note, each preset does retain it's own brightness and other OSD settings so you can set each of them up separately. Calibration results were very poor sadly. As we mentioned earlier, the image felt very strange, with a cartoony style to the colours, fonts and images. The calibration process could correct gamma, white point and luminance pretty well, and also maintained an excellent static contrast ratio. However, colour accuracy could not be corrected and was very poor. dE was 4.0 average / 13.8 maximum. I'm not sure why you would ever want to use this mode given it's strange feel and poor colour accuracy. I also calibrated the screen in the sRGB preset. Again, you cannot individually control the RGB channels in this preset or change the colour mode as it is a pre-defined sRGB setup. Brightness was changed to 100 in the OSD which is the only change made to the hardware. The calibration process would make adjustments to the graphics card LUT from there. We'd already seen from factory defaults that this mode that the luminance of the screen was more limited than the standard preset. This mode cannot be used to deliver a higher luminance point than this. After calibration, the sRGB preset returned very similar results to the standard mode. Gamma, colour temperature and luminance were all corrected nicely. Colour accuracy was now 0.9 dE average / 2.6 maximum. As we saw in the factory setting tests, this mode seems to be identical to the standard mode in terms of performance, only with a lower luminance setting. The 100% setting in this mode seems to return a luminance which would have been achieved at around 65% in the standard mode. There's no real benefit in using this mode over the standard really. 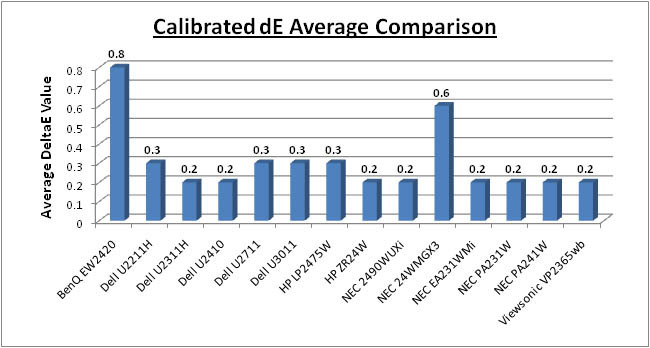 I have plotted the colour accuracy results of the EW2420 against some of the other competing models we have tested. 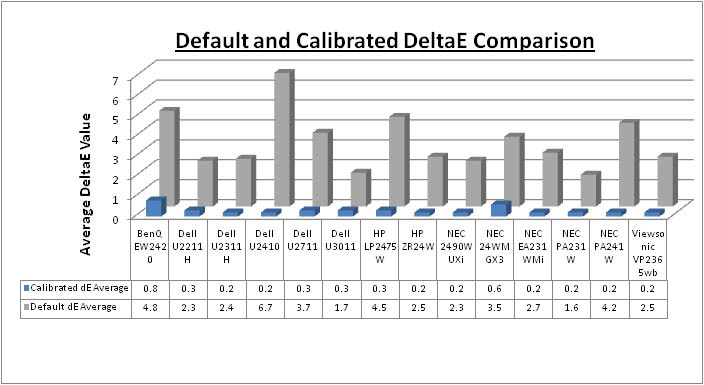 As you can see, default dE average was pretty poor in comparison with the other models at 4.8. This was a little better than the Dell U2410 (6.7) but behind all the other models. It was quite close to the NEC 24WMGX3 which is also AMVA based (3.5). The EW2420 does not appear to have a reliable factory calibration setup so if you want to do any colour critical work you will need to calibrate the screen, ideally with a colorimeter. Once calibrated, the standard preset returned the most accurate colours. However, dE average was still only 0.8 which left it behind the other models here. Again it was quite close to the NEC 24WMGX3 (0.6) but the other models we have tested here are all IPS based screens and offer dE average of 0.2 - 0.3 after calibration. LaCie would still classify colour fidelity as being excellent overall on the EW2420 after calibration, but it is not quite as reliable as the IPS screens. 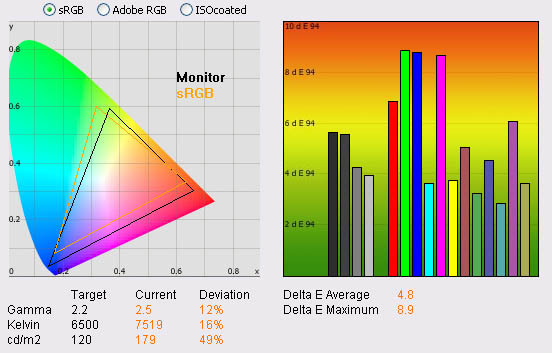 On the other hand, black depth and contrast ratio are where the EW2420 really is strong. The calibrated black depth of 0.04 was fantastic, and the best we have ever seen from a desktop monitor. Excellent performance here and a considerable way ahead of all the other models. 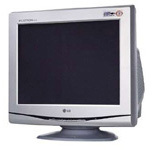 The NEC PA231W and Dell U2311H 23" models were the closest with 0.14. 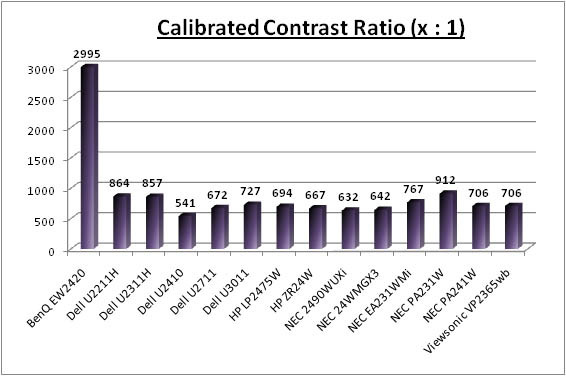 Static contrast ratio was excellent as a result, with a figure of 2995:1 recorded after calibration. None of the other models can compete with this, the closest being the NEC PA231W at 912:1, still less than a third of the contrast ratio offered by the BenQ EW2420. The luminance range of the screen was a little limited at the top end. At 100% brightness control, the screen was only able to offer a maximum luminance of 179 cd/m2 which is a fair way off the advertised 250 cd/m2. If you want to use your screen at a higher than normal luminance such as 200 cd/m2 you will be stuck here unfortunately. Having said that, you have a decent range to work with at the lower end as you can adjust the backlight down to achieve a low luminance of around 59 cd/m2. A setting of around 50% at default settings should return a luminance of around 120 cd/m2 for comfortable day to day use in normal lighting conditions. If you carry out further calibration or adjustments of contrast or the individual RGB channels this of course may vary. Black depth was very impressive across the whole range, being between 0.05 and 0.02. In fact at the lowest end the reading was even less than 0.02 but that is the limit of the LaCie Blue Eye Pro colorimeter unfortunately. Contrast remained very stable across the range. In fact most of the variation can probably be accounted for in rounding of the numbers, particular black point which is so low across the board and does not change massively at two decimal places. A static contrast ratio of >3000:1 is incredible! The BenQ EW2420 features a dynamic contrast ratio (DCR) control, which boasts a spec of 20,000,000:1 (20 million:1). The DCR feature can be selected through the OSD when you are in the game, movie or photo preset modes. It is not available in the standard, ECO or sRGB presets. When the function is active you can actually control its level from 1 to 5. While this mode is in use, you cannot manually adjust the brightness or contrast settings in the OSD without it turning this feature off. The changes are smooth and sublte so are not going to be too obvious to the naked eye as content on the screen changes. The differences between settings 1 and 5 were so subtle that you couldn't really tell any difference. So where does this 20 million:1 figure come from? - As opposed to gas-discharge lamps (CCFL), LEDs can be lit up instantly or turned out completely. This can lead to extremely high levels of dynamic contrast. Figures in the millions are very common now. 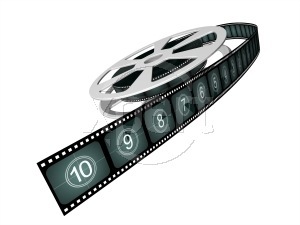 But in real applications, for example when watching a movie, there are no absolutely black frames even in the credits. Most of the time there is something on the screen besides blackness and a monitor with a huge specified dynamic contrast will never have the chance to deliver it in practice. As a result, there is no real practical point in increasing the dynamic contrast higher than about 10,000:1 which has already become standard for many monitors, including those with a backlight based on CCFL lamps. Keep in mind that DCR figures are often exagerated as a result, and since you will probably never get to utlise the full figure in practice, don't be fooled into buying into the hype too much! The dynamic contrast ratio control seemed to work pretty well although because of the extremely low black point it was not possible for us to measure the maximum figure due to hardware limitations. The X-rite i1 Display 2 Colorimeter (used in the LaCie Blue Eye Pro package) has a minimum measurement limit of 0.02 cd/m2. Since the screen has such low black depths (0.05 cd/m2 even at 100% brightness) it left us a little limited in this test. On a white screen the DCR controlled the brightness up to about 158 cd/m2, and at the lower end we lost the black point off the scale at less than 0.02 cd/m2. DCR is at least 7900:1 but will be much higher. As I've said above, there's not really any practical limit for anything much higher than this. When you consider how low the black point is anyway, and the fantastic static contrast ratios returned of >3000:1, it's probably questionable whether you need this at all on this model. Viewing angles of the EW2420 were as you might expect from an AMVA panel really. Horizontally they were reasonable. However there was a contrast shift from an angle of >40° either side which made the image go a little yellow and pale. From a wider angle still the image had a white tinge to it and you can pick this out from the images above. Vertically they were a bit more restrictive with a fairly noticeable contrast shift detectable with even a slight movement up or down. The angles were certainly better than TN Film matrices in these regards, and free of the obvious vertical darkening you see from TN Film technology. However, they were not as wide as IPS matrices and the contrast shifts were more noticeable unfortunately. There was also a pretty obvious off-centre contrast shift which is inherant to VA panel types. Using a test image which shows a dark grey font on a black background you can easily test this 'feature'. From head on, the text was invisible and lost within the black background. This is down to the pixel alignment in a VA matrix. The text only became visible from a wide angle in this test, of about 45°. This is an extreme case of course as this is a very dark grey tone we are testing with. Lighter greys and other colours will appear a little darker from head on than they will from a side angle, but you may well find you lose some detail as a result. This can be particularly problematic in dark images and where grey tone is important. It is this issue that has led to many graphics professionals and colour enthusiasts choosing IPS panels instead, and the manufacturers have been quick to incorporate this alternative panel technology in their screens. I would like to make a point that for many people this won't be an issue at all, and many may not even notice it. Remember, many people are perfectly happy with their TN Film panels and other VA based screens. Just something to be wary of if you are affected by this issue or are doing colour critical work. The uniformity of the panel fairly moderate overall, and there was some issues evident. Approximately 75% of the screen remained with 10% deviance of our target luminance of 120 cd/m2 which was measured at a central point. However, in the top corners of the screen the luminance dropped down to 96 - 99 cd/m2 (21 - 25% deviance) which was a shame. Along the bottom edge of the screen, the luminance was also a bit higher at around 129 cd/m2 in the left hand region. Although we do not have a copy of the M240HW02 V1 spec sheet, it looks as though the screen is edge lit from the bottom perhaps using a single side emission. The uniformity of edge lit W-LED backlighting is controlled by a diffuser. This is explained in more detail in our LED backlighting article. I tested the screen with various coloured backgrounds including greys and whites to see if there was any sign of colour tinting across the panel. On a light grey background you could just about pick out the luminance difference, with a lighter lower section of the screen being detectable with close inspection. There was no obvious colour casting across any part of the screen thankfully from our sample. As usual we also tested the screen with an all black image and in a darkened room. A camera was used to capture the result. The uniformity of the backlighting was pretty good in this test. There was some very slight leakage in the corners as you can pick out in the image, but it was not too severe and harder to pick out with the naked eye. There was no severe leakage from any edge which was good to see as well. I wanted to acknowledge the user reports which can be found on the internet that the LED backlight uniformity of the EW2420 (and indeed other new LED VA panels from BenQ) can be quite variable. Some users have reported far from ideal black uniformity, with obvious variations in luminance across the screen, sometimes even in a wave-type appearance. As you can see from our tests above, the sample we had shows some slight leakage from the corners in a black image test. A white measurement shows the luminance uniformity is a little brighter towards the bottom edge of the screen as well. We have not seen any severe backlight leakage issues in our sample, but I would advise you excercise distance selling rights if your panel is defective in this way. I do not want to put users off purchasing this screen however as we have not seen any real issues here and user reports will always vary from one screen to another. You can see this on most monitors. One thing we did spot from the screen after careful close inspection was a very slight "LED ripple" effect along the bottom edge. There is a small strip of <10mm where you can just about detect a ripple caused by the LED's illuminating the screen and the gaps inbetween each individual diode. The section is visible on light coloured backgrounds and appears a little yellow. It's quite hard to pick out to be fair and quite minor, but again we'd like to acknowledge its existance. 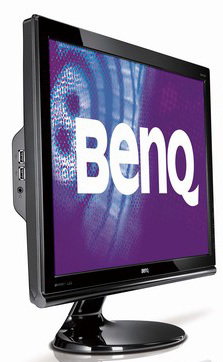 The BenQ EW2420 offers a perfectly adequate solution for general office and internet applications. The 1920 x 1080 resolution and 24" screen size offer a good screen real estate to work with, and side by side splitting of the screen is perfectly useable. The slightly reduced vertical resolution (1080 pixels) compared with a 16:10 format screen (1200 pixels vertically) means you do lose a bit of height however. I personally prefer a 1920 x 1200 screen for office work. The 0.276mm pixel pitch offers a comfortable text size for day to day use, a little bigger than some of the modern ultra-high resolution models like the 2560 x 1440 res 27" models for instance. Default luminance of the screen was recorded at 179 cd/m2 which is a little too high for prolonged use. You will want to turn the screen down to about 50 - 60% brightness to achieve a luminance of around 120 cd/m2. In doing so you also reduce the power consumption of the screen which is a positive thing. Being W-LED backlit, the screen is already very eco-friendly, so you are doing your bit for the environment by using a screen like this. This is even more important if you are working in an office environment with many screens in use daily. The savings soon mount up. The inbuilt ECO mode preset can also help you reduce energy consumption which is handy. There are no specific 'text' or 'internet' presets available from the Senseye menu, so you will probably want to calibrate the standard or sRGB modes to a lower luminance, or just use the ECO mode option. I tested the screen using both the analogue D-sub and digital DVI-D interfaces. The DVI offered a noticeably sharper image and better picture quality, and the D-sub was actually pretty disappointing by modern standards. Text was readable, but clarity was lost. I would definitely recommend using the digital interface wherever possible. Ergonomically the screen was a little lacking, with only a basic tilt function available. A height and swivel function would have been nice to see, but I suppose you can't have everything at this kind of price. Rotate is also missing of course which some may find useful on other screens. The 4x USB 2.0 ports are useful to have, especially with two being available for easy access on the left hand side of the screen. There's no card reader (as on the Dell U series) or ambient light sensors which are sometimes nice to have I think. The built-in audio pass-through and speakers might be useful in an office environment for general 'office / Windows' sounds. The BenQ EW2420 was tested using the chase test in PixPerAn, a good bit of software for trying to quantify differences in real terms responsiveness between monitors. As a reminder, a series of pictures are taken on the highest shutter speed and compared. The images below show the best case example on the left hand side, and the worst case example on the right hand side. This should only be used as a rough guide to comparative responsiveness but is handy as a way of keeping a constant test of each screen. Before we get into the side by side screen comparisons I wanted to talk about the Advanced Motion Accelerator (AMA) mode. AU Optronics actually rate their M240HW02 V1 panel (used here) as having a 25ms response time. This is the ISO response time of the panel without any form of response time compensation and representing the black > white pixel transition. BenQ have however enabled an RTC impulse for this panel via their AMA function, which serves to boost pixel responsiveness across grey to grey transitions. They have therefore rated the screen at 8ms G2G. The AMA function can be turned on and off via the 'picture' section of the OSD menu. As you can see from the PixPerAn test images, the monitor does behave quite differently depending on whether you activate this technology. With AMA turned off there is a very obvious and pronounced motion blur and ghosting to the moving image which is pretty severe. You can see this reflected in the images captured above where there are 3 trails of the car in the best case example, and 4 in the worst case example. This is poor responsiveness unfortunately and not really suitable for any fast moving scenes in movies and games. Thankfully the AMA function works fairly well. 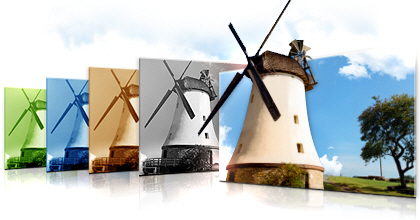 The blur is noticeably reduced in practice and the trailing images are reduced as shown above. The moving car image is a little sharper to the naked eye and the screen feels more like a modern panel. The responsiveness is not as fast as some other modern overdriven TN Film and IPS panels, but the AMA function certainly helps a bit. Thankfully there is no major overshoot of the RTC impulse in this AMA mode, so there are no obvious dark or bright halos behind the moving images. You can spot some slight artefacts during some transitions but nothing too obtrusive. The AMA function is enabled and disabled via the OSD menu as shown above. I have provided comparisons here of the EW2420 against some of the other popular 23 - 24" models we have tested. As you can see, the BenQ is the worst performer in this test and cannot quite keep up with the modern IPS panels which have become so popular. The Dell U2410 and U2311 have a more effective RTC impulse which helps reduce the blurring to a decent standard. Modern IPS matrices do seem to be inherantly more responsive than even the latest generation of AMVA panels as well. Perhaps this has not been the focus of AU Optronics recently, or perhaps the pixel structure and operation just does not cater for anything much faster than this. I have also included the NEC 24WMGX3 for comparison here since this is also an AMVA based screen. This does show a better responsiveness than the new BenQ EW2420 but is a screen aimed almost entirely at the multimedia and gaming user. The screen should still be adequate for some casual gaming and with AMA enabled can handle fast moving scenes in movies without any real issue. It's not the fastest panel out there, but a lot of users will still find it suitable for average gaming requirements. I would certainly recommend having AMA enabled on this screen whatever your use. If you are a more serious gamer, you may want to consider some of the faster models out there, including some of the modern heavily-overdriven TN Film panels with 120Hz technology. For comparison I have also included the results from our current reference screen above, the Samsung SM2233RZ. This shows the type of responsiveness that is possible from a modern display. The BenQ cannot keep up with this screen at all. The Samsung is also free of any noticeable RTC overshoot artefacts, and this is largely due to the use of 120Hz technology which helped eliminate these issues in our tests. The screen does feature a dynamic contrast ratio control if you want to use it and if you run in the 'game' preset mode. Some gamers like this as a feature, some do not so that's down to preference. There is also hardware aspect ratio control available through the OSD with options for 'full' and 'aspect'. You can also turn overscan on and off for certain inputs and sources. 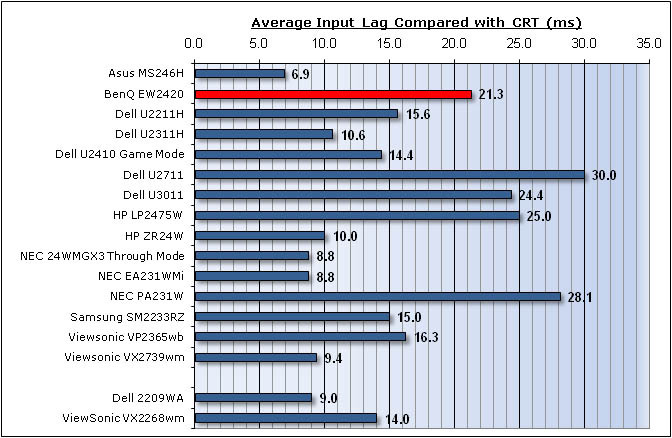 The input lag of the EW2420 was moderate with an average of 21.3ms recorded. The input lag did range between 10 and 30ms commonly, but 30ms was recorded as the maximum. This is a similar input lag to the HP LP2475W (25ms) but was a little behind some of the other 24" models we have tested. The Dell U2410 for instance had an input lag of 14.4ms when using the 'game mode' which featured a bypass of some of the internal electronics to reduce input lag. Having said that, 21.3ms is hardly a high input lag and should be fine for most casual gamers. We've already seen that the pixel responsiveness is not the best but again adequate for general gaming. If you are a serious gamer or play a lot of FPS games, I would recommend looking elsewhere. The pixel responsiveness is probably more of a deciding factor in that recommendation than the input lag though. 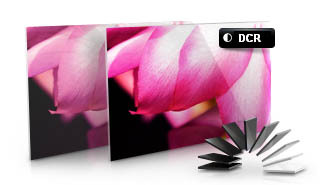 Dynamic contrast ratio is available and extends the already excellent ~3000:1 static contrast ratio to >7900:1. If you like this feature, it can control the contrast for you quite well, and with smooth transitions. With a static contrast ratio as high as it is, you may not need it though. Movie preset mode is available. This makes the screen a little brighter and makes colours more vivid and cartoony. You will lose some accuracy using this mode, but this may be desirable for the sake of the bright colours in videos. Fairly wide viewing angles thanks to AMVA panel technology making it suitable for viewing from different positions and for multiple viewers without issue. The off-centre VA contrast shift could present a problem when viewing from head on, particularly in darker scenes. Limited ergonomic adjustments available with only basic tilt function. Might be difficult to obtain a decent viewing position of the screen. A height adjustment would have been useful. There was only very slight backlight leakage from the corners, which was barely detectable to the naked eye. Not a problem at all in practice which is good as that issue has the potential to become distracting when watching movies, especially where black borders are present. 2x 1.5W integrated stereo speakers available for some 'light' sounds, but not up to much in the bass department. Headphone jack also available for quieter viewing. The BenQ EW2420 left us with some mixed feelings really. First of all I thought it would be useful to consider what the LED backlighting actually offered us? The only real benefits of the technology are the thin screen profile, reduced weight and reduced poer consumption. These things are useful of course and are really why LED backlighting is becoming so popular at the moment. However, there still seemed to be a few issues and limitations with the technology. Colour gamut is of course more restrictive than modern W-CCFL backlighting, and with a gamut covering ~72% of the NTSC colour space it cannot compete with the 92 - 102% coverage of som CCFL backlit displays. 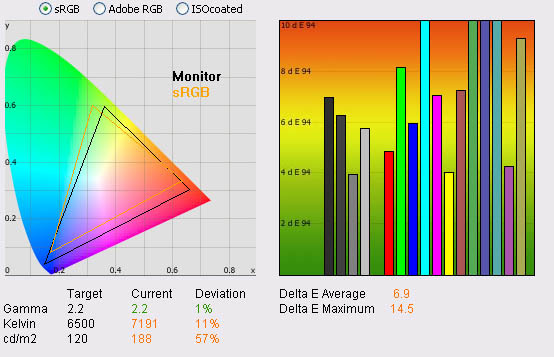 However, this isn't necessarily an issue as many people are still looking for standard gamut / sRGB monitors for their workflows but it's something you'll need to consider if you are looking for a wider colour space for your workflow. Panel uniformity isn't perfect as well, especially if you take into account some of the early user reports of the EW2420, VW2420 and VH2420H models. There are also some minor issues like the LED 'ripple effect' which will need correcting in future generations. I think the main thing to keep in mind is not to get too dragged into the hype of LED backlighting, and instead understand what it can truly offer and whether that is of value to you as an end-user. Aside from the LED backlighting we had some positive and not so positive feelings about the EW2420. Dealing with the negatives first - the viewing angles of the AMVA panel technology were a little more restrictive than you will find from the competing IPS models out there, and the off-centre contrast shift was perhaps even more pronounced than we had seen on other VA panels in the past. Responsiveness was fairly moderate really and although ok for some casual gaming, it cannot compete with the overdriven TN Film and IPS matrices in the market today. Colour accuracy was pretty poor out of the box and although it could be corrected pretty well through calibration, it was again a bit behind the other IPS models we have tested. On the positive side, the black depth and static contrast ratio of the panel were fantastic, with the best performance we have ever seen in our tests. The EW2420 also has a pretty decent range of interface options and a few extra features (Senseye, USB ports, integrated speakers) which might be useful. The final most obvious positive for the EW2420 is its extremely competitive price point. At the time of writing the screen retails for ~£190 GBP (inc VAT) in the UK. This puts it at a much lower price than other popular 24" models such as the Dell U2410 (£470) and HP ZR24W (£330); and at a very similar price point to many of the TN Film based models in the market. The EW2420 does offer some pretty reasonable all round performance and some nice features and options to go along with it. It's not the best performer we have seen, but at £190 it's well worth a look for the casual all-round user.